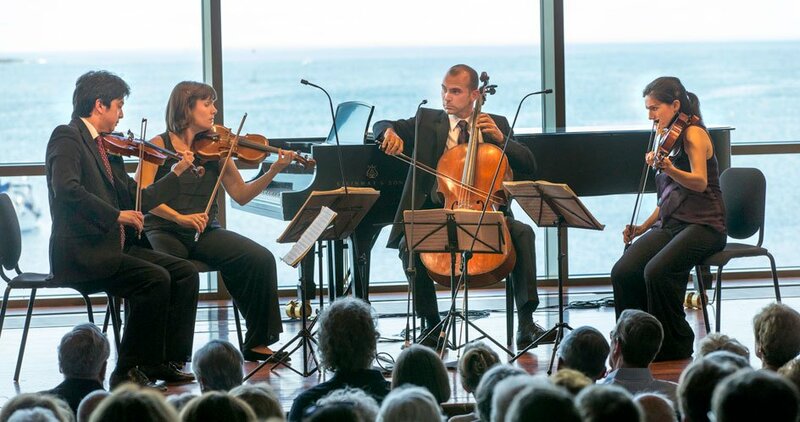 Jupiter String Quartet and Philadelphia-based Jasper Quartet shared the stage, as copious chamber music riches rewarded all at Rockport’s Shalin Liu Center last night. Jasper opened with Haydn’s second of the Lobkowitz Quartets, the opus 77. The first violin of the Jasper, J Freivogel, may not be overly muscular, but his leadership was firm and intonation pure. This was just what was needed for a fully rewarding take of Haydn’s masterpiece. 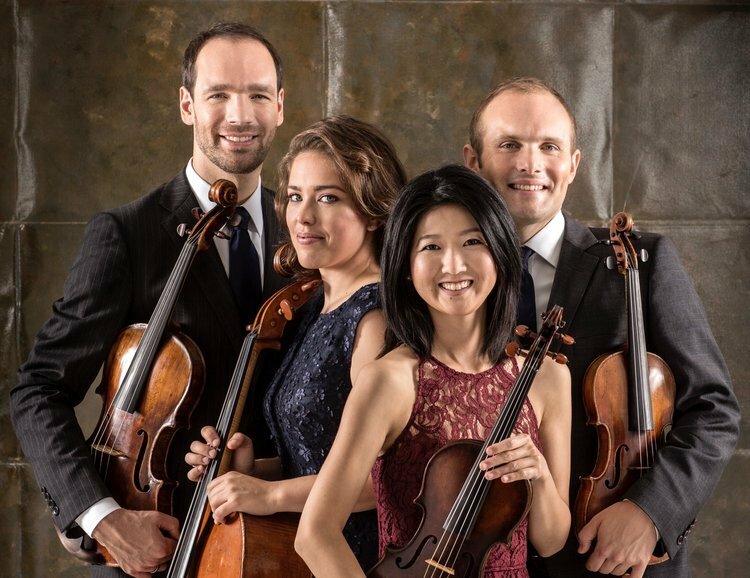 The F Major quartet bursts with so many musical ideas and so much drama that it should be worth the price of admission all by itself; in this case it was. The violin and cello dramatized their dialogues with flair and possibly with slight exaggeration of the—the sort of embellishment that makes live performance stand apart. György Ligeti’s String Quartet No. 1, “Métamorphoses nocturnes” (Budapest 1953-54), stands as one of the most accessible major chamber pieces of the post-WWII period; it hardly needed the traditional sandwiched position. The writing is remarkably figurative, with emotional and wistful protagonist theme contrasting with the relentless drive of the folk material familiar from Bartok—all brilliantly characterized in this concert. The remarkable variation of textures over 17 continuous movements lifts it high above any conventional expressionist plot. The Jupiter foursome has clearly lived with the Ligeti for some time. It felt well broken in and mastered. Its haunting sonorities emerged as a most natural, yet thrilling series of visions. The second violinist Megan Freivogel is expecting and it was hard not to wonder in what form the conscious memory of the baby might one day reflect the ethereal muted trills coming from the fingers of the mother. In Mendelssohn’s Octet in E-flat Major, Op. 20, J Freivogel again led [ed. note: there was a third Freivogel on stage!] with pure intonation and flair, but also again in a close concord with his colleagues, rather than in an alpha manner. The octet, which occasionally might sound closer to a concerto, this time came across as a series of spirited conversations. We can guess whether or not it was what the 16-year-old composer had in mind—after all, he was composing a tour de force for his own violin teacher Eduard Rietz. In the event it discoursed with pure joy. The conversational spirit was further helped by the seating scheme: the quartets sat as mirror images of each other. The Allegro Moderato con fuoco of the octet was indeed an ultimate party piece, as Jupiter’s cellist Daniel McDonough promised in his introduction in the first half of the concert. Especially in the gorgeous build up to the recapitulation, the clear and transparent execution helped the listener appreciate the fully-formed compositional chops of the precocious composer. After the appropriately soulful Andante, came another Walpurgisnacht vision: the quintessential Mendelssohnian scherzo. How pleasurable yet paradoxical to connect this feast of life with Ligeti’s ghosts. What better embodiment of the spirit of the Enlightenment can you find anywhere than the young Felix taking inspiration from Goethe’s gathering of the witches and turning it into his inimitable scherzo genre? A little more than hundred years earlier, they used to burn people for this stuff, and they would again. The finale positively exploded with energy and harmony. Eight players unleashed unbridled individual expression in the fugato as Mendelssohn’s healthy Walpurgis magic exorcised Ligeti’s nightmares of 1953 Budapest. A bright strawberry moon over Rockport was the last vision we beheld. While not a fan of atonal music, I must say that I found the Ligeti quartet immensely fascinating — the variety of string tone elicited by the Jupiter was unlike anything I have heard, and the ensemble playing seemed to me absolutely perfect. On the other hand, J Freivogel seemed to me too dominating and his string tone at times metallic and shrill. Nonetheless it was a rare opportunity to hear and compare the two quartets, as well as their combined efforts on the Octet. Thank you, Victor! It’s been a pleasure to read your short, fine in both style and thought essay. Bravo!